Without proper fit, a dress shirt just won’t look right. The designer and the quality of the fabric is secondary. No matter how exclusive a dress shirt designer and fabric, if the fit isn’t right, it just won’t look good on you. Sometimes bad fitting destroys the beauty of a good dress shirt. To make sure that this doesn’t happen to you, we compiled all the fitting advice you need to know. Below are some basic tips that will ensure your shirts will fit perfect. The collar fit of the dress shirt is most important. It is the part right underneath your face, and even if you wear a suit jacket, it will always be the focal point of your shirt. 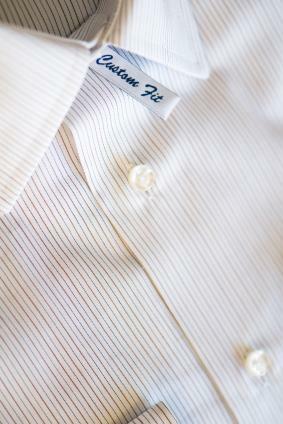 In the US, dress shirt collars are measured in inches and are made in ½ inch increments. So before you buy a new shirt you should know your neck size. To measure your neck, take a flexible measuring tape and lay it around your neck where the collar will be. Round up to the next ½ inch, but not any larger. The shirt is supposed to fit slightly snug on your neck without constricting you. As a quick test do this: Take two fingers and slide them between the closed collar and your neck. If two fingers fit then the shirt will be right for you. Three fingers, and the shirt collar will be too large. If only one finger fits, the shirt might be uncomfortable –especially if the fabric shrinks a little after washing and drying the shirt. Since arm length varies, shirt makes typically offer two different sleeve length for each collar size. To make sure that a dress shirt’s sleeves have the right length for you, do the following: Put on the dress shirt and stand up straight with your arms hanging down on each side. The cuffs of the shirt should end at your wrist bone. Then move your arms forward to see how much the sleeves pull up on your arms. If it is more than ½ inch, then the sleeves are too short. If you are planning on getting a custom tailored dress shirt, your tailor will measure your arm length. To do this stand up straight, then run the tape from the center of the back of your collar to the top of your shoulders then down to the arms and the wrist bone. As far as cuffs are concerned, you have two options: French cuffed dress shirts that are worn with cufflinks, or standard cuffs. What you choose is personal preference. The cuffs should fit tight enough so that your hands don’t slide in, but should also have enough room for your wrist watch to fit inside. There are three standard cuts: The America, the French, and the English cut. The American cut is the fullest while the French cut, sometimes also called European cut, is more tapered at the waist. The British cut is somewhere in between the two. What type of cut you choose depends on your body type. If you have an athletic build than the French cut is an excellent choice. It compliments your body type and will fit much better on you. The American cut on the other hand, is much better suited for bigger men. Dress shirts come in a wide range of collars. If you have a larger neck size (larger than 17 inches) it is recommended that you wear a shirt with a wider collar spread as this will allow you to tie a larger necktie knot such as the popular double Windsor tie knot. Narrow collar spreads, and button down collars are better suited for thinner men and should be combined with smaller necktie knots such as the classic Four in Hand Necktie knot.